Twelve-mile portion of the Lower Mountain Fork River and its tributaries from the Broken Bow Reservoir spillway downstream to the U.S. 70 bridge. 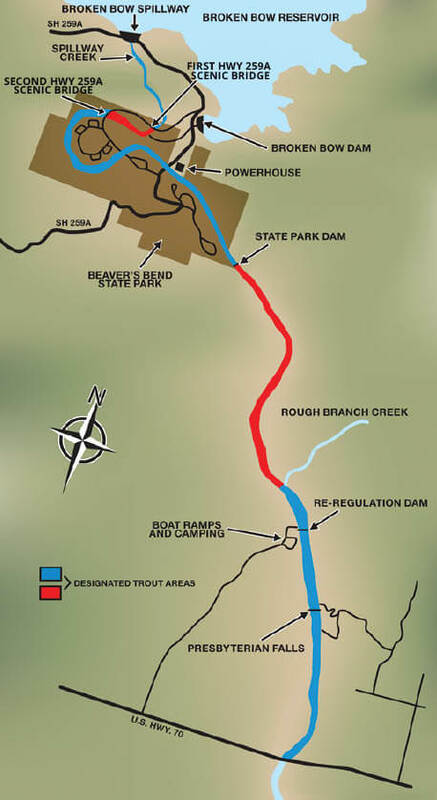 About five miles of this designated trout stream lies within Beavers Bend State Park, in McCurtain County. Bank access is unlimited within the state park and downstream to the re-regulation dam. Another public access point exists at Presbyterian Falls. Boat ramps are just upstream of and below the re-regulation dam. Camping and cabin facilities are available within Beavers Bend State Park and below the re-regulation dam. For information, call the park at (580) 494-6300. For weekly fishing reports for the Lower Mountain Fork River, visit www.flyfishoklahoma.com or call (858) 480-5142. Brown trout – Daily limit: one; size limit: 20-inch minimum. Rainbow trout – Daily limit: six combined from Red and Blue Zones. See Zone regulations below. Rainbow trout – Daily limit: six; no minimum size limit. Use of bait and barbed hooks is permitted. Rainbow trout – Daily limit: one; Size limit: 20-inch minimum. Possession of any trout less than 20 inches is prohibited. Use of bait or barbed hooks is prohibited in the Red Zone. Fishing is restricted to barbless hooks, artificial flies and artificial lures only (see Trout Regulations). ANS Alert: Didymo, an aquatic nuisance species commonly referred to as “rock snot,” has been identified in the Lower Mountain Fork River. To prevent spreading this undesirable organism, please clean and dry waders and other fishing equipment after use in the Lower Mountain Fork River. Trout are stocked from Nov. 1 through March 31 of the following calendar year. A 6.25-mile portion of the Blue River flowing through the Blue River Public Fishing and Hunting Area located in Johnston County, four miles east of Tishomingo on State Highway 78 and six miles north. Bank/wading access is available throughout the area (see accompanying map). 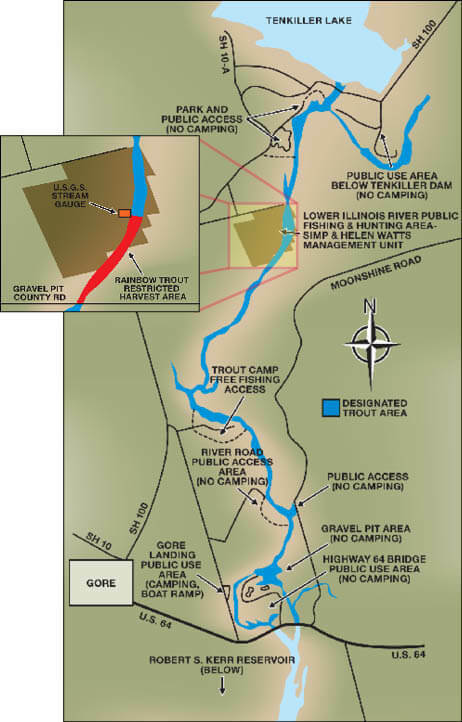 Camping facilities available only at the Blue River Campground area (see map). Special access is provided for people who use wheelchairs. For information, call (580) 443-5728. For complete public use restrictions, see Department Fishing Areas. 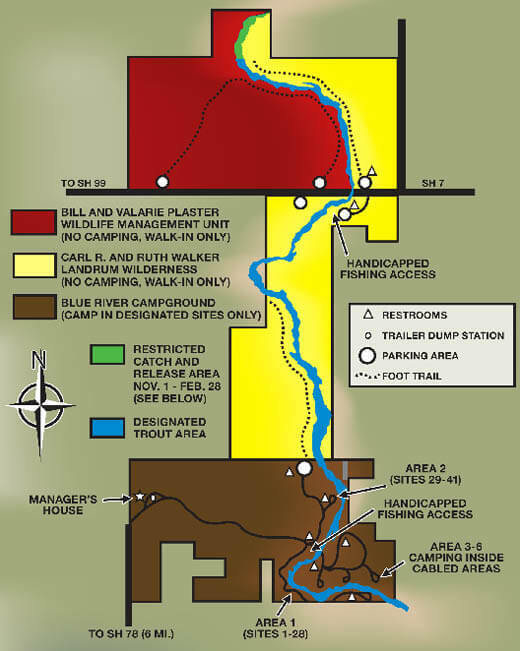 From Nov. 1 to Feb. 28, the portion of the Blue River which enters the north side of the property and flows to the end of the first walk-in trail is catch-and-release only (see shaded area on map) and fishing is restricted to barbless hooks, artificial flies and lures only. Starting March 1, special regulations do not apply. Also, no camping and no vehicles are allowed except in designated parking areas of the Carl R. and Ruth Walker Landrum Wilderness and the Bill and Valerie Plaster Wildlife Management Unit. Nonhunting and nonfishing visitors to the area are required to possess a Wildlife Conservation Passport, unless exempt (see License Requirements & Exemptions). Trout are stocked from Nov. 1 through March 15 of the fol­low­ing calendar year. A 1.5-mile portion of Fourche Maline River immediately below Carlton Lake Dam downstream to the southern boundary of Rob­ber’s Cave State Park, located in Latimer County, five miles north of Wilburton on State Highway 2. 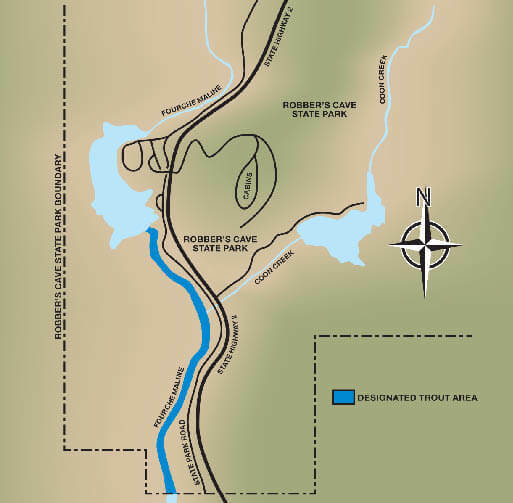 Bank access is good because the entire designated trout stream lies within Robber’s Cave State Park. Camping and cabin facilities are avail­able with­in the state park. For information, call (918) 465-2565. Trout are stocked from Nov. 1 through April 30 of the following calendar year. This 159-acre lake is within Black Mesa State Park in Cimarron County, about 30 miles northwest of Boise City. Berms extending from the south bank. Boat ramps on east and south sides of the lake. Camping facilities, including hook­ups, are available within the state park. For information, call Black Mesa State Park at (580) 426-2222. Trout are stocked from Nov. 1 through March 15 of the following calendar year. Medicine Creek from Gondola Lake dam downstream to the State Highway 49 bridge. A sidewalk along the east side of Medicine Creek in the town of Medicine Park will offer the best fishing access. Parking and fishing access also will be found along the creek’s east bank just north of the State Highway 49 bridge. The west side of the creek is mostly undeveloped but is accessible on foot. Anglers should avoid trespassing on any residential property. Camping facilities are available at the nearby Wichita Mountains Wildlife Refuge. For more information, call the refuge headquarters at (580) 429-3222 from 8 a.m. to 4:30 p.m. weekdays. Lodging is available in and around Medicine Park. A 7.75-mile portion of the Illinois River from Tenkiller Ferry Dam to U.S. 64 bridge near Gore in Sequoyah Coun­ty. 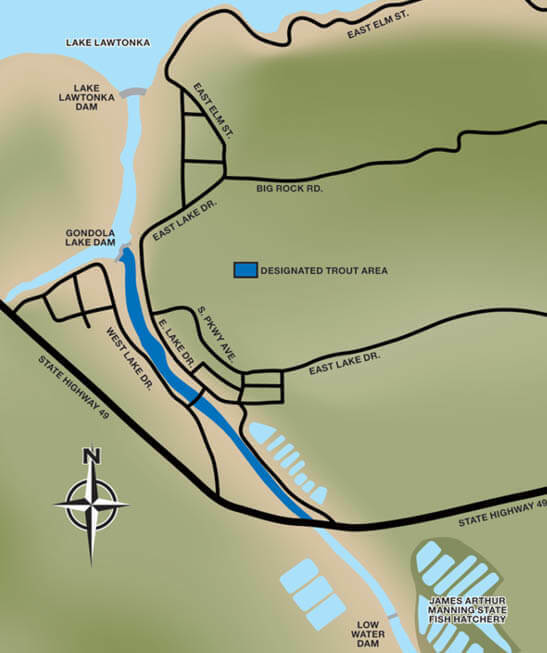 The Lower Illinois River Public Fishing and Hunting Area – Simp and Helen Watts Management Unit offers public fishing access to almost one mile of the trout stream and 320 acres of public hunting opportunity (see map). To reach the area, travel north on State Highway 100 from Gore about four miles. Turn east onto county road E0990 and travel about one mile to the entrance. Park in the designated parking area only. The area is managed for walk-in access only. Four other public access sites are available along the state-designated trout stream, including a pool off the river located immediately below the dam which allows trout fishing even during high power generation. Another good site is located at the River Road Public Access Area about six miles downstream from the dam. The Gore Landing Public Access Area, operated by the town of Gore, (918) 489-2636, offers camping and a boat launching ramp. Brown trout – one; 20-inch minimum length. Rainbow trout – six, no minimum length. From USGS stream gauge downstream to Gravel Pit County Road: one; 20-inch minimum length. Trout fishing in the Lower Illinois River Simp and Helen Watts Management Unit from the USGS stream gauge downstream to Gravel Pit County Road is restricted to artificial flies and lures only and barbless hooks only (see Trout Regulations). Single barbed hooks 3/0 or larger may be used only when fishing with natural bait for species other than trout. Artificial baits and treble hooks with barbs when using hooks 3/0 or larger are also allowed when fishing for species other than trout. (see Trout Regulations). No overnight camping is allowed on the area. Trout are stocked from Nov. 1 to March 31 of the following calendar year. One mile south of Perry off State Highway 86 in Noble County. This 32-acre lake is within five minutes of Interstate 35. Bank access plentiful; boat ramp on west side of the lake. Historic pavilions near the south shoreline were projects of the Civilian Conservation Corps in 1934. The City of Perry issues permits for fishing and boating. Camping is available nearby. For information, call (580) 336-4241. Seven miles north of Watonga in Blaine County. This 55-acre lake is within Roman Nose State Park. Bank access and a boat ramp on the west side of the lake. Camp­ing and lodge facilities are available within Roman Nose State Park. For information, call the park at (800) 892-8690.